"sub" and "sup" elements are inline elements. "sub" and "sup" elements can not be used at block level. Contents of "sub" elements will be displayed in smaller font size, and positioned lower than normal text. 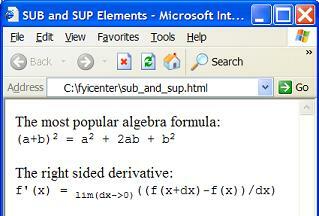 Contents of "sup" elements will be displayed in smaller font size, and positioned higher than normal text.